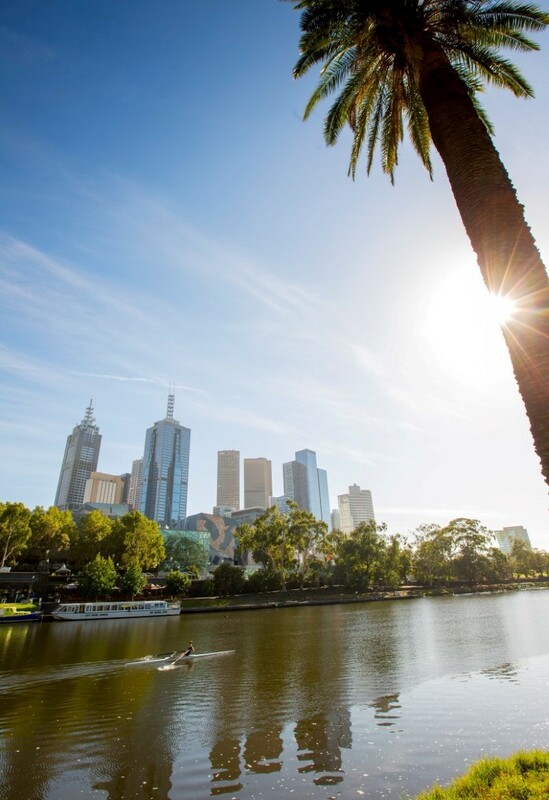 Alexandra Gardens and Queen Victoria Gardens sit adjacent to each other on the southern bank of the Yarra River. 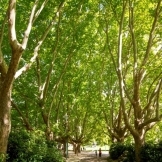 They link the Domain Parklands with the central city and provide 10 hectares of green open space. 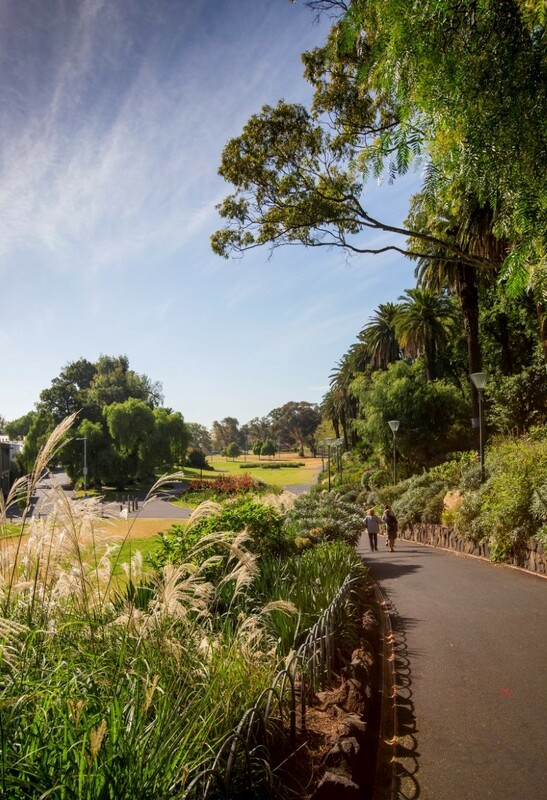 The Queen Victoria Gardens is known for sweeping lawns, colourful flower-beds and ornamental ponds. 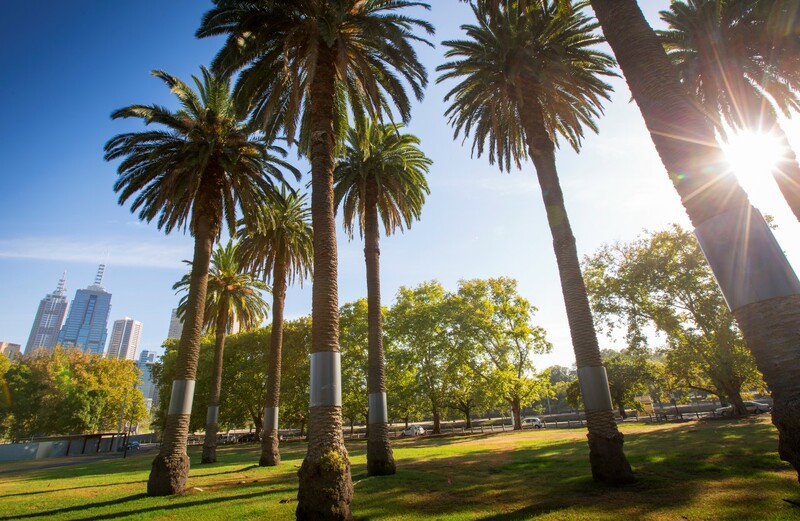 The Alexandra Gardens are known for palm-lined avenues and open lawns. Many high profile events are held at the gardens each year. Providing enough water to keep both gardens healthy during the increasingly severe impacts of climate change, including drought, heat waves and water restrictions has been a challenge. 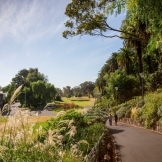 The Alexandra and Queen Victoria Gardens stormwater harvesting system captures, treats and stores 20 million litres of stormwater each year to be used for irrigation, reducing the potable water consumption in the garden by 55 per cent. 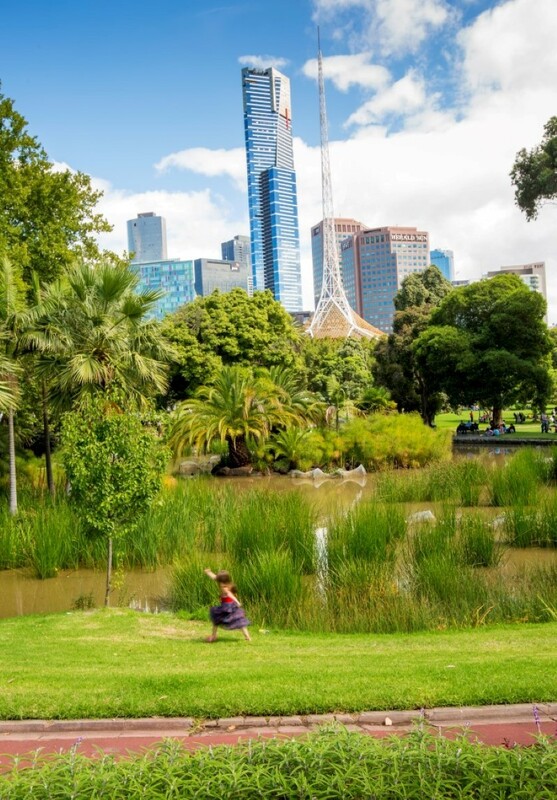 The innovative system makes use of retrofitted ornamental ponds in Queen Victoria Gardens for storing stormwater. 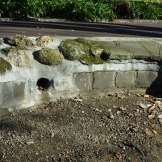 Water is diverted from the existing drains beneath Queen Victoria Gardens into a gross pollutant trap where large items, such as leaves and litter, are removed from the water. Next, a long sedimentation chamber settles out small particle pollution, including fine sand and oil. A pump transfers the water to a series of three ponds, which we retrofitted for stormwater harvesting. When the water level in the ponds reaches a certain threshold, it is pumped across to Alexandra Gardens for treatment, via a pipe under Alexandra Avenue. In Alexandra Gardens, a biofiltration garden bed naturally removes pollutants from the water as it seeps through the soil and plant root systems. The clean water is collected under the bed in a pump well and transferred to an above ground storage tank. The tank stores 230 kilolitres of water for irrigation. Excess clean water is returned to the Yarra River via the stormwater drains. The level of soil contamination and structural quality provided many design challenges and drove many of the design outcomes. Delivering a major project in an operational event space can be done successfully, provided that careful planning is undertaken during the design phase. The project manager must liaise with a much more broad range of stakeholders than would usually be required. In 2008 a water plan was developed to show different types of vegetated spaces in the gardens and the estimated irrigation requirements. This information was used to design the system. A geotechnical assessment carried out in 2009 revealed that underground water storage would not be possible due to unstable soil conditions. This constraint influenced many facets of the final design. Music modelling carried out in 2011 showed that retrofitting the ponds would be an effective method for treating the stormwater. Based on this research, concept designs were created for the system in 2012. This included developing a planting plan to determine the most appropriate water plants for nutrient removal and aesthetic value in a heritage space. Bundling several WSUD projects together into one larger project was more cost efficient than completing them separately because consultants could be contracted to work on all projects at once. By considering the environmental benefits of the projects collectively, it also became more attractive to potential funding partners. The gardens are both mainly Coode Island silt, which is not stable enough to support an underground water storage tank. Instead, we used the existing ornamental ponds in Queen Victoria Gardens for storage and treatment. The size of the ponds limited the capacity of the final system design. 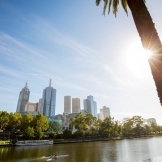 The stormwater runoff in this catchment has a high volume of fine sands, which accumulate from the nearby Tan running track and St Kilda Road tram lines. This extra sediment can damage the pump impellers if left untreated. To ensure that sand is removed, we located the gross pollutant trap and sedimentation chamber before the pump. 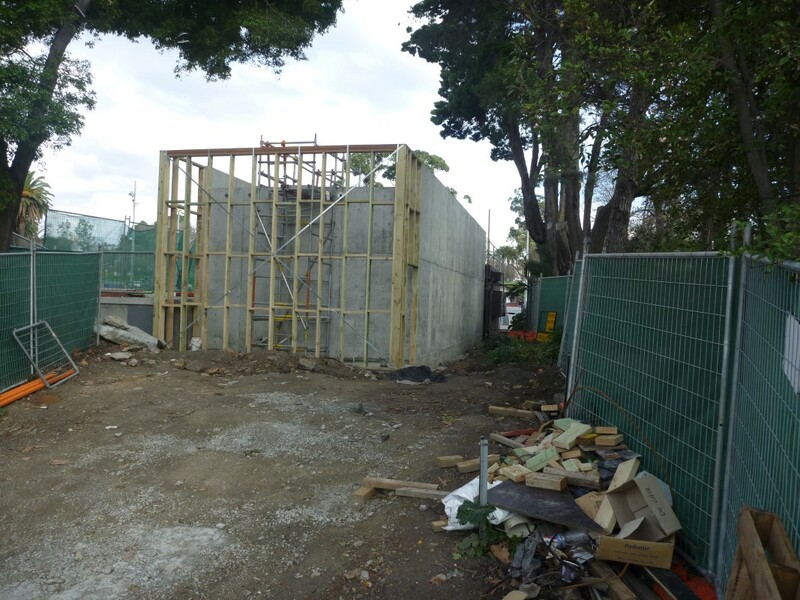 Due to the unstable soil, we had to position the storage ponds and treated water tank on either side of a major arterial road – Alexander Parade. Getting water from the storage ponds to the tank was a challenge for the design and construction team. With careful mapping of existing cables and a traffic management plan in place, a tunnel was bored under the road at night. 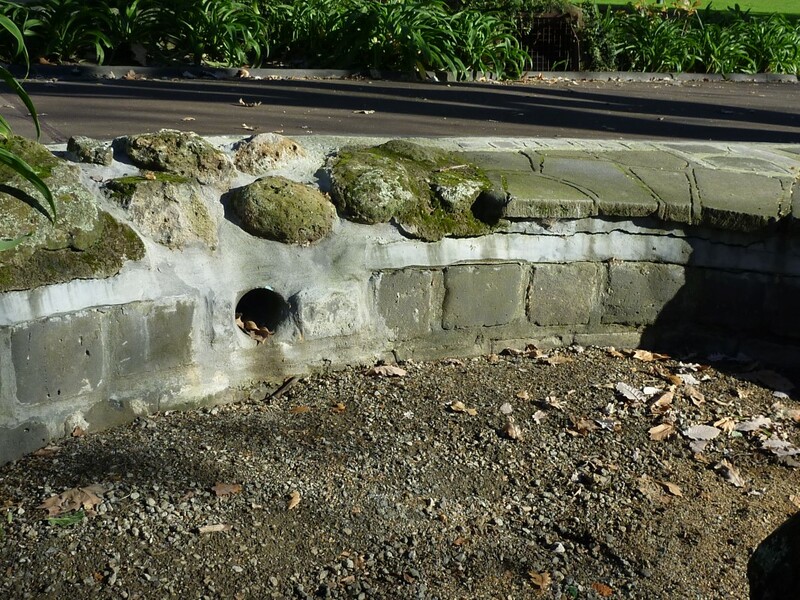 Working with the existing ornamental ponds in Queen Victoria Gardens presented some challenges. The ponds each have their own elevation, so the water levels are controlled separately. This added complexity to the design and operation of the system. Careful consideration was needed by our landscape designer to insert pits, pipes and other structures without negatively impacting on the overall aesthetic of the gardens. 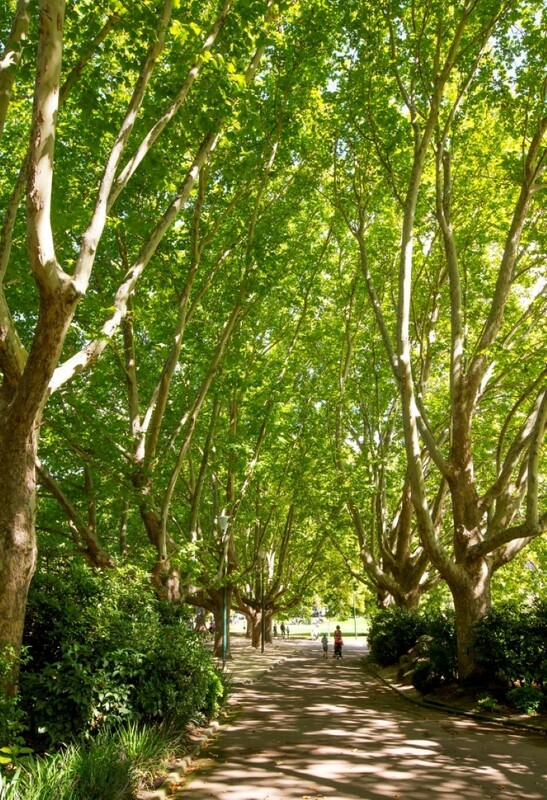 A planning permit was not required, but during the initial design stages, Alexandra and Queen Victoria Gardens were nominated for inclusion in the Victorian Heritage Register. We consulted Heritage Victoria to ensure that the system would not have any adverse impacts on a potentially heritage listed landscape. Runoff is diverted into the system from an existing 600 mm stormwater drain running under the gardens. The water travels through a gross pollutant trap and into the sedimentation tank. It then flows into the pump well to be transferred to the storage ponds. When the ponds are full or the diversion network is at capacity, excess stormwater continues down the regular drainage system via an overflow pipe. The first structure in the diversion network is a gross pollutant trap, or GPT. Due to the known high volume of fine sand in the water, a Humeguard GPT was placed in front of the pumps, rather than after. It removes course sediment (greater than 150 microns) that might damage the pump impellers. The GPT removes about 9 per cent of the litter and debris from the water, 99 per cent of the sediment and 20 per cent of the nutrients (nitrogen and phosphorus). The GPT is inspected every three months and accumulated litter removed. Litter is removed from the GPT by a large truck with a suction hose about three times per year. A typical GPT has a lifespan of ten years. We have included the cost of replacing the GPT into the maintenance budget. The sedimentation chamber is located directly next to the GPT. It allows suspended particles of pollution – fine sands, sediments, oils and hydrocarbons – to settle to the bottom or float to the surface. The chamber is made of 250 mm thick concrete and was lowered into place using a crane. Like the GPT, it is located before the pumps to protect the pump impellers. The sedimentation chamber is cleaned out with a suction hose when the depth of sediment measures 0.5 metres. Unlike other stormwater harvesting systems in Melbourne, existing ornamental ponds were used as the primary water storage for this system. The Coode Island silt soil was too unstable to support an underground tank system. Three ornamental ponds have been retrofitted for stormwater storage, with a total capacity of 1.1 million litres. Partially treated water flows from the diversion system to the first pond, then to the second pond before entering the third pond. The ponds each have their own elevation, so the water levels are controlled separately through an automated system. Each pond also has a maximum drawdown level. This ensures there is always enough water to prevent algal growth, support healthy plants and maintain the aesthetic value. The first pond, known as the Children’s Pond, is shallow and primarily used as additional sedimentation area than for high volume storage. The pond is approximately 200 m2 in size. We control the water level in this pond with a permanent weir that allows overflow into the second pond. The second pond, known as the Nymph Pond, is 1100 m2 in size. It is deeper and functions as both storage and treatment. Wetland plants across the inlet zone and around the perimeter remove nutrients from the water. Similar to a raingarden, the biofilm that forms on the plant stems takes up pollutants, cleaning the water. We control the water level of this pond with an overflow weir. The drawdown of water from this pond is generally set to 300 mm from the top level. This level is controlled by the central control system and can be varied. The third pond, known as the Lower Pond, is the largest and deepest. It is 2100 m2 in size and between 500 and 900mm deep. Its primary function is storage, though water plants around the perimeter provide some nutrient stripping as well. A pump is used to transfer water from the lower pond to the biofiltration bed in Alexandra Gardens. It maintains a minimum water level of 300 mm below top level. The diversion pumps shut off automatically when the ponds and the storage tank are full. The Nymph Pond had a clay base liner that was rolled across the base. Rocks, clay and soil for planting were placed on top. The Lower Pond held water well throughout the drought and was deemed to be fairly water-tight. Only minimal contouring was carried out to provide more planting opportunities. Due to the varying elevations of the existing ponds and biofiltration bed, pumps are an essential component for transferring water throughout the system. Two 40 litres per second pumps and one 20 litres per second pump are used to transfer stormwater from the diversion system to the Children’s Pond. The pumps engage depending on how heavy the rainfall is. In high rain flow events, the full 100 litres per second capacity is used. Pumps also transfer water between the Lower Pond and the biofiltration bed, and from under the biofiltration bed to the reuse tank. An automated butterfly valve is used to manage the levels and flows between the Nymph Pond and the Lower Pond. The biofiltration bed cleans dissolved pollution from the stormwater, removing nutrients like nitrogen and phosphorus. The biofiltration bed is constructed the same way as a typical raingarden. It has sand filtration, transition and drainage layers. Unlike a raingarden, the biofiltration bed is surrounded by a one metre tall retaining wall. It is periodically flooded with water from the Lower Pond. The flooding and resting cycle is based on the detention time of the water. This, in turn, is determined by the hydraulic conductivity of the filter media. The cycle time is pre-set. It is adjusted over time as the filter medium clogs and slows the detention time. Replacing the top of the filter media on an annual basis helps renew the conductivity. The clean water drains naturally to the pump well. It is then pumped to the above ground storage tank where it is stored for irrigation. The above ground tank is located in Alexandra Gardens, next to the biofiltration bed and public skate park. With a total storage capacity of 230,000 litres, the tank is 4.5 metres tall, 5.5 metres wide and 15 metres long. The UV disinfection, irrigation pumps and control are housed alongside the tank. Due to the unstable soil we couldn’t place the storage tank underground. However it was constructed in the place of a former depot building to ensure that no public open space was lost. Several locations for the reuse tank where considered through the design phase. The final location, where it replaced an underutilised former depot building, was the best compromise for size, constructability and conforming to heritage and aesthetic needs. Plants are used to take pollutants from the stormwater in the upper and lower ponds, as well as the biofiltration bed. Aquatic plants are used within the ponds, as well as some floating in the centre of the Lower Pond. The collective plant coverage is approximately 1600 m2. The top layer of the biofiltration bed was planted with wetland plants, Juncus gregiflorus and Juncus procerus. These native Australian rushes were planted as tube stock, which is cheaper than pre-grown stock allows them to fully establish on site. The grasses are cut back once a year, when the filter medium is replenished. 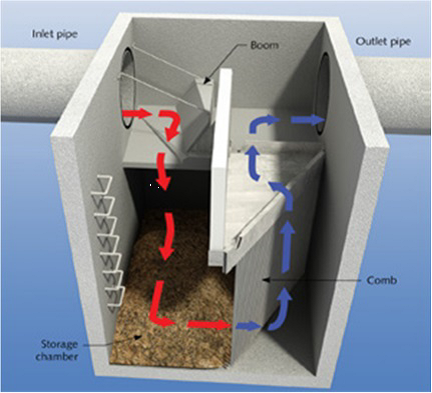 The stormwater harvesting system is complex, with main levels that turn pumps and valves on and off. Following completion, it was tested for six months. This included testing for possible problem scenarios and refining the level and pump control system settings. Due to the multiple levels of the ponds, the biofiltration bed and the above ground tank, the movement of water between each element requires a valve or pump. This introduced extra complexity to the design and management of the system. Maintenance costs around $33,000 per year. This includes weekly and monthly inspections, removing litter from the gross pollutant trap, replacing plants and filter media, and electricity costs. Water quality monitoring is particularly important in this system because the storage ponds are highly visible. Although this will make any water quality problems easy to detect, the problems will also be obvious to garden visitors. We monitor the water’s pH and salinity levels. Samples are also taken during irrigation season to check for E. coli, turbidity, sodium, chloride, heavy metals and herbicides. We also monitor other water quality indicators, with expected pollutant reductions detailed below.